Essex Federation of Young Farmers Clubs has scooped the R.A.B.I YFC Cup in recognition of its efforts and contributions to the Royal Agricultural Benevolent Institution (R.A.B.I) during 2014. 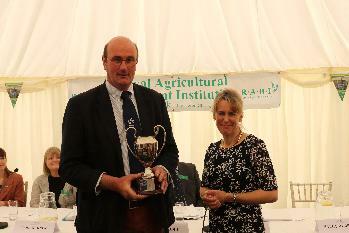 President-elect Jeremy Fulcher received the award, which recognises the outstanding fundraising carried out by YFCs, from National Farmers’ Union (NFU) deputy president Minette Batters in front of a packed audience at R.A.B.I’s annual meeting last week. R.A.B.I is a grant-making charity which helps farming people of all ages if they are in financial difficulty. It gave £1.93 million in grants to farming people in 2014 and helped people claim £378,000 in state benefits. Support ranges from helping people to pay utility bills and council tax arrears, rent and bankruptcy fees, to paying for funerals, heating, clothing and even food. Essex YFC members were quick to respond to the flooding crisis in Somerset in the winter of 2013 and organised delivery of fodder to the worst-hit farmers. Later in the year, vice chairman Ed Ford presented R.A.B.I with a cheque for over £7,500 to help with the charity’s welfare work. The Essex YFC Country Show pulled in thousands on Sunday 17 May, with highlights including quad stunts, food hall and live demonstrations from the forestry and game fair areas. R.A.B.I regional manager for the East, Lucy Bellefontaine attended the show which is organised solely by volunteers aged 16-26 years from the Federation of Young Farmers Clubs around the county. Approximately £1,000 was raised from a raffle for farming families in financial difficulty with first prize of a bike won by Mrs Bunting, and second prize of a hamper donated by local business Tiptree Wilkins & Sons won by Mr Metson. To find out more visit www.rabi.org.uk or call R.A.B.I.’s confidential helpline on 0300 303 7373.